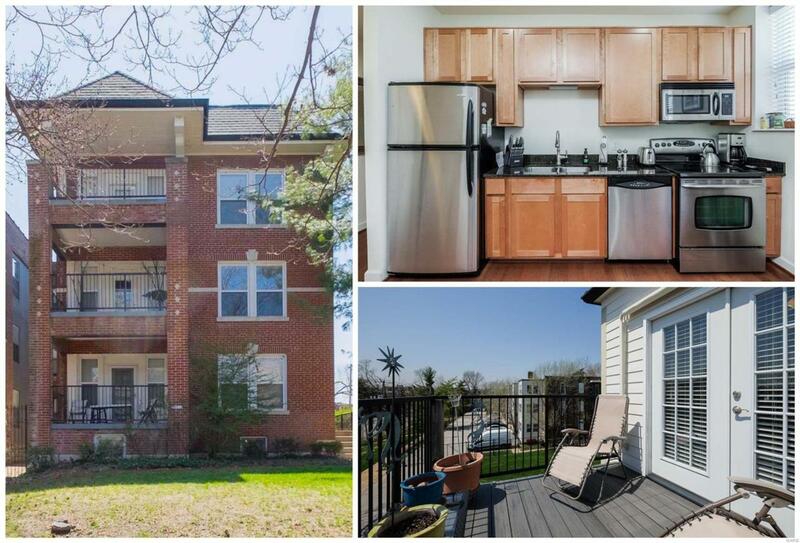 This beautifully updated condo is not to be overlooked! It truly is a must see! Located on the most charming street and in a very secure & quiet building, this unit has 3 sides of windows, a private & sunny balcony, plus TWO gated parking spaces. Beautiful hardwood floors, large open living & dining area with French doors leading to a RARE private deck! Fantastic kitchen updated with granite countertops, stainless appliances and great space for a breakfast nook. Two large bedrooms with great natural light and new carpet just installed. Spacious bath with fantastic granite double vanity. In-unit laundry with newer washer & dryer included, fantastic storage area, community patio area perfect for barbecues, TWO GATED PARKING SPACES just outside the door, and LOW CONDO FEES! Walkability to neighborhood pool, Forest Park & MetroLink. PLUS Wash U & BJC students/employees may qualify for a housing grant and free shuttle to campus! This one has it all... location, updates & convenience!